Meet alpha, a safe and lightweight infant car seat with latch base to click and go. A safe, adaptable and lightweight innovation from phil&teds that solves a parents key challenge of carrying baby safely in a vehicle, on a buggy and on your arm. The alpha car seat fits on to many strollers to create your very own complete travel system, including all current phil&teds strollers. The alpha is ultra-easy to install in to the car with a latch base to click the car seat in and out, and on to the stroller with one hand. You will be safety assured with huge high side protection, thick EPS foam, 5-point harness with chest clip and removable padded liner for newborns. The quality design and cleanable fabrics look great both in car and on buggy. Alpha car seat is specially designed to maximize convenience and minimize disturbance to baby for happier parenting. Purchase a travel system bundle with alpha or click alpha to your phil&teds stroller using our range of car seat adapters. 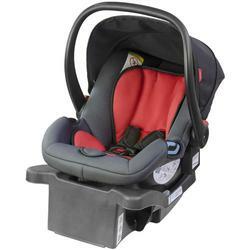 For easy click & go travelling, install your alpha car seat using the latch base, or use the seat belt in your vehicle. Note: alpha infant car seat comes with latch base included. Extra latch bases for a second car are sold separately. Thickened EPS foam on high sides offers extra protection for your baby’s head, neck and upper body. A removable cushioned liner is included to keep your newborn cosy & secure. Alpha car seat’s easy to adjust harness features non-slip shoulder padding with chest clip, and is easy to secure in place for a perfect fit every time! The integrated sun hood allows you to shelter baby from the sun in & out of the car. So lightweight, alpha is easy to lift and transfer from the car to stroller & beyond. The ergonomically shaped handle offers maximum comfort for carrying alpha in your hand, or transferring from car to stroller.